Hiring works out helpful in reducing the cost of weddings, large social events , Country Fayres and Equestrian event. 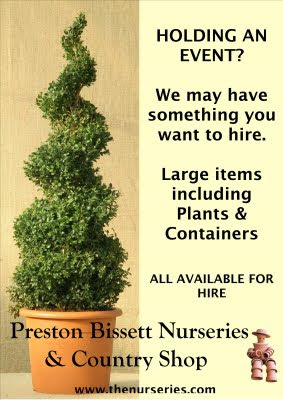 You may wish to hire Box balls or large pots to place at a formal enterance on archway or topiary to mark out a temporary walkway. Hiring is a fraction of the cost of purchasing something you need for a one off event. Call in and talk to us or get in touch via email or phone.